There’s a familiarity about Italy that I blame on over twenty years living in Italian neighbourhoods. We went into a local supermarket yesterday, and the kids said it was just like Lamonica’s in our suburb, selling croccanti, crostoli, panettone, chinotto and a ton of Nutella. We’re here to meet my husband’s Italian family and last night we shared New Year’s Eve with them. I think I’ve finally worked out the relationship. 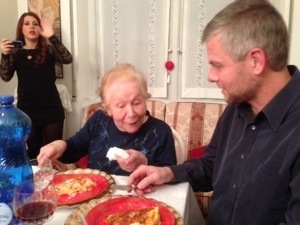 Here’s my husband with the woman who was married to his half-great uncle, Zia Nina. Which makes her son Giorgio his half second cousin. I think. I’ve discovered that I can understand some of the conversations going on around me, and can sometimes answer a “come si dice?” question. For a brief period in May of 1984 I could actually speak Italian in whole sentences, sometimes even using correct tenses. There are echoes of this ancient skill still lingering and I hope I can drag some of it to the useful part of my brain in the next couple of weeks. While my husband was discussing the family tree with cousin Giorgio and his fabulous wife Isabella, I was discussing the nature of colonials being obsessed with genealogy with a man who bore a striking resemblance to my father. Here he is with the Muffet. Luciano is the godfather of Giorgio and Isabella’s daughter. He said that Italians are not interested in such things. The reason is that they know where they belong, and it is here. 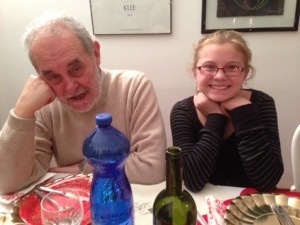 Giorgio has lived in his apartment for sessanto anni (sixty years). 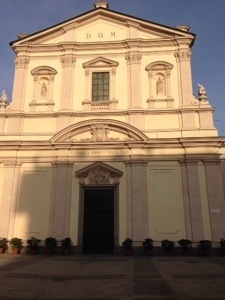 On a walk around Milan today he showed us the church where his parents were married. It struck me for the first time what a wrench it must have been for all the Italians who live in my area to uproot themselves and travel half way around the world. No wonder they maintain such strong ties with their home village. Anyway, the night was about the food. Mamma Mia, so much food. First some salumi, some carciofi, some Ligurian olives. 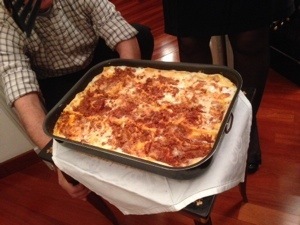 Then some homemade lasagne Isabella’s friend Titi had made and brought. “You know lasagne?” she asked. Oh, how we laughed. It was so good, and much lighter than the Southern version we were familiar with. I was wise to the ways of the Italian feast, so had left some room for the roast chicken that followed, but I was a bit worried my husband was going to burst at the seams. Especially as we must also have the fruit salad that Luciano had brought. It contained twelve fruits for the months of the year that had just been, and the Muffet and I managed to guess them all, though I’d argue that an almond is not really a fruit. I really liked it in the fruit salad, though, made a mental note. Then we had to eat a bunch of grapes naming the months as we ate each one (a good refresher). And then, of course, the panettone which is far nicer fresh than after it has spent months at sea to arrive at Lamonica’s. Also torrone, of which I’m very fond, especially the Venetian version brought by Titi that looked like the Alps. And chocolate. Very lucky. Then more champagne, which wasn’t champagne but a lovely light dry prosecco claimed by our hosts to be far superior to that French rubbish you spend so much money on. And then the fireworks lit by the local lads out on the street which were very entertaining, especially after one lot fell over and started randomly strafing them. So now I know what it is like to have a food hangover on New Years Day rather than the conventional kind. But Isabella still has a fridge full of food for us to eat that she didn’t manage to serve last night, so we soldier on. I’m going to have to move in to the gym when we get home. Lovely post! And a happy new year to you!